Last week, the Mumbai customs department clamped down on Chinese e-commerce players like Shein, Ali Express and Club Factory for sending shipments as ‘gifts’ to customers in India and avoiding duties. Customs officials allege that the companies are exploiting a law which permits Indians living abroad to send ‘gifts’ worth up to Rs 5,000 to relatives at home without paying any duty. The Federation of Indian Export Organisations (FIEO) is pushing the government to act. “We have told the government that it should remove the duty exemption for gift items up to Rs 5,000 or limit the benefit to a single consignor,” said a senior FIEO official. 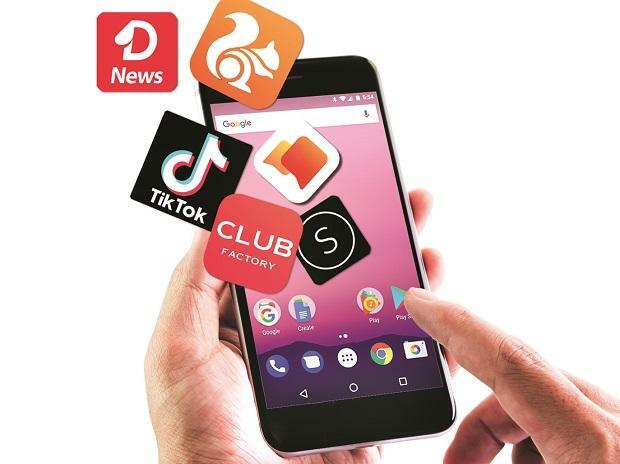 The Swadeshi Jagaran Manch has pointed out that these apps pose a threat to domestic manufacturing and retailing as they do not pay relevant taxes such as GST, giving them a huge edge over local players. The indignation over the e-commerce players comes close on the heels of a stinging attack on Chinese telecom equipment manufacturer Huawei by domestic manufacturers who believe that Huawei’s gear, and that of ZTE, poses a security threat to India. A few months ago, the army directed its troops not to use 41 Chinese messaging and social media apps on their devices for fear that they could contain spyware and could be hacked. Similarly, the Telecom Equipment and Services Promotion Council has urged the government to restrict the use of Chinese telecom equipment over security concerns. The Council has complained, further, that while the Chinese have been imposing various non-tariff barriers on exports of equipment to their country, India has opened its doors to theirs. The Centre for Internet Society has suggested that the situation calls for more government intervention, ie that Chinese players with a stipulated number of subscribers must set up an office here if they want to continue to operate. Or an audit should be made of the apps. Or perhaps rules need to be put in place to prevent someone harvesting SMS data. In the midst of this brouhaha, the government response has been muted. The Department of Industrial Policy and Promotion (DIPP), the nodal agency for e-commerce sites, said it cannot unilaterally cut off consumer access to open domain applications. "The same can be said about a lot of apps registered outside India and providing services here. We can't prosecute everyone as of this point," said a DIPP official in response to the claim that the Chinese apps were breaking the rules. Instead the DIPP is pinning its hopes on the new e-commerce rules which are being drafted and which will incorporate data privacy and taxation issues, apart from a host of technical aspects such as technology transfer, server localisation, and connectivity issues. "Since the scope of the policy is broad, the new draft may incorporate specific clauses that establish certain criteria for foreign companies selling their products and services here," said the DIPP executive. This is not to say there is total stasis. The Finance Ministry, for example, is considering limiting the number of ‘gift’ consignments to four per person per year. And in Mumbai, the customs office has told staff to keep an eye out for mis-declaration and smuggling of goods imported through couriers. But a senior official at Jawaharlal Nehru Port Trust - India's largest entry point for such goods - said it was difficult to physically check the parcels. He said standard operating procedures may need to be put in place for the vigil to be effective. Perhaps the one area where the government response to these matters has been the most muted is the decision by the Department of Telecommunications to let Huawei start 5G trial runs, despite concern from many quarters about the danger of Huawei’s equipment being used for spying. The Centre for Internet Society said the use of the Transport Layer Security 1.3 software protocol would have made it substantially harder for foreign telecom vendors to snoop on Indian traffic. “When the Internet Engineers Task Force (IETF) was finalising the TLS protocol, a consultation paper was floated on this issue by the Ministry of Electronics and Information Technology, but unfortunately the process was abandoned and the Indian government did not participate in the IETF discussion. Now, of course, this standard has been accepted. But the government should be active in such international standard making bodies,” said Sunil Abraham, a member of the Centre for Internet Society board. Luckily for India, said Abraham, despite the government’s lack of involvement, the protocol will make it difficult for Chinese players to hack Indian’s networks. For some, the alarms being raised about national security are little more than a diversionary tactic by Indian companies unable to cope with Chinese competition. “The pertinent question is whether this is a “trade war” masquerading as a “national security” issue. It’s also pertinent to ask Indian industry how much they have invested in R&D in the last 10 years,” asked Cellular Operators’ Association of India Secretary General Rajan Matthew. The demand for equipment in India is so large, he added, that it is not possible for only the Europeans to meet it. And the Association has ensured competitive pricing for service providers. True, Indian consumers are lapping up Chinese offerings – not only because they are cheaper, say analysts but because they are often trendier, more innovative, and offer more choice than many Indian e-commerce platforms. Club Factory has a worldwide user base of more than 70 million with 40 million users coming from India alone, according to the company. Shein, a fashion platform, caters to more than a million daily active users and handles over 10,000 orders daily with an average ticket size of between Rs 1500-Rs 2000. 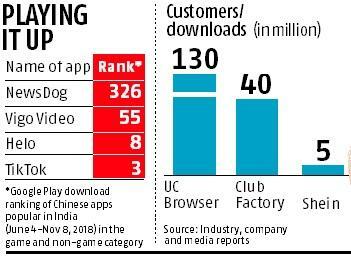 And in the app space, despite the army’s warning, UC Browser (the third most popular mobile browser in the world by market share, after Google Chrome and Safari) claims to have 130 million monthly active users. (WhatsApp has 200 million). This is still far behind Google Chrome which has a 56.27 per cent share of the Indian mobile browser market compared to UC Browser’s 23.66 per cent last December, according to Statcounter. But UC Browser is trying to increase its user base further by tying up with phone manufacturers like Xioami so that the app comes pre-installed. The sheer popularity of Chinese products and services with Indian consumers is a factor that the government may not be able to ignore as it works out how to deal with these companies.